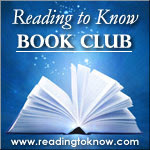 Tammy from Bluerose's Heart is here with us this month to lead the discussion for December's book club read. 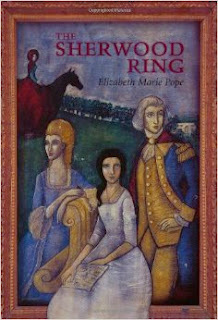 She chose The Sherwood Ring , by Elizabeth Marie Pope. I always like her picks because they are usually different than other people's choices. I think I can confidently say that Tammy picks books for me that I wouldn't choose for myself - which is great! I decided to go the easy route with my pick this year. Last year, I enjoyed my pick, Wolves of Willoughby Chase, so much that I simply went to its Goodreads page and scanned for "similar" recommendations. The Sherwood Ring was the first to catch my eye, even though it had apparently caught my attention in the past, since it was already on my "want to read" list. I skimmed around and saw high ratings, along with the word "unusual" jumping out several times, and decided my pick was made. My hopes are up that I will enjoy it as much as Wolves of Willoughby Chase! Will you be reading with us? We hope so! Leave a note and let us know. I picked up a copy of this a shops to get to it!